Roadrunner driving school based in Forest Gate Newham, covers the surrounding area and all of East London. They are one of the few driving schools to cover the outer edges of East London, including Woodford Green, Buckhurst Hill and Loughton. The school has been running just under 20 years and it has built up a reasonable reputation in this period. Based on their online reviews, the school has a reasonable reputation. On Facebook they have a 4.8 out of 5 rating, based on 19 reviews, however on Google they do not perform as well. They have a 2.3 out of 5 rating based on 14 reviews and there are a number of 1 star reviews on their profile. Their Yell.com profile has less reviews and it has a rating of 3.2 out of 5 based on 5 reviews. The comments on Google suggest there are issues with professionalism with some of their instructors and in such cases, we recommend booking a few number of lessons first, before committing to a larger block booking. Pricing wise, Roadrunner driving school is very competitive and their introductory offers are very attractive. They often advertise their offers on Facebook and their special offer of 3 1hr lessons for £55 is great value for money. 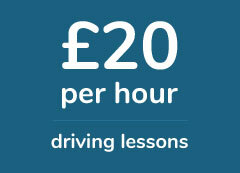 Roadrunner driving school have the option of paying online for driving lessons through Paypal. Simply select the times and dates you would like to start and then make payment. Once complete, one of their instructors will call you to confirm your booking. It’s quite easy to use, especially if you are in a rush, but bear in mind there is an additional £2.50 charge for all online bookings. If you have just turned 17, they have a buy one get one free offer on your first driivng lesson. This is a good offer for any learner driver just starting out and its an inexpensive way of getting to know your driving instructor. If you are unemployed, work for the NHS or a student, you can get 15% off the cost of a block booking of 5 driving lessons. This is a saving of £10, as the normal cost of 5 1 hour lessons is £100. One great aspect of Roadrunner driving school is their training videos. They give you a sense of the schools teaching style and give you a chance to meet one of your potential instructors. The videos show Wahid Ali – the owner and managing director of the school – going through some of the concepts taught during a typical lesson. The videos cover the cockpit drill, moving off and stopping, the cars’ controls, turning in the road and reversing around the corner. We have included the introduction video for you below. The useful info section of their website has information on the different topics in the driving syllabus. You can find information on how to deal with roundabouts, pedestrian crossings and the history of the driving test among other things. If you would like Roadrunner driving school to reschedule a driving test for you, they do have this option available. For £40, they will reschedule your test at a test centre of your choice. For more information check out their short notice driving test page. *The cost of rescheduling does not include the cost of the test itself. Great lessons, affordable prices and my instructor was really patient with me. A friend of mine recommended RoadRunner and after my first lesson with them, I knew it was the right driving school for me! I was really nervous before the start of my driving lessons. but my instructor calmed my fears and built up my confidence. Learning to drive with Roadrunner was a pleasure and I passed my test with only a few minors. Great company, one of the best independent driving schools operating in East London and I was recommended to Roadrunner by a friend of mine. I owe him a drink for this!. Needed my driving license within a month and Roadrunner were great. My lessons were intensive, really full on, but enjoyable. I felt confident within a couple weeks, and passed my test at the first attempt. My test was in Goodmayes and the route was simple.